Juliette Karagueuzoglou is a fine fragrance perfumer who works for International Flavors & Fragrances. She earned her BA in Chemisty before attending ISIPCA, and in 2006 the IFF Perfume School in Grasse, France and New York. 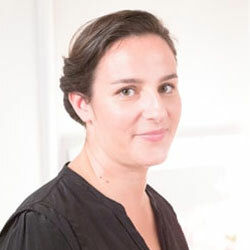 She has worked for Expressions Parfumees in Grasse, and joined IFF in March 2002. She was named Junior Perfumer of Fine Fragrances, Paris, in July 2007 for IFF. In 2010 she won the Fashion Group International Rising Star Award.